This Blonde Brownie Recipe is an easy brownie recipe to make. Using simple ingredients, these are ready for the oven in no time at all. For extra flavor, add chocolate chips and pecans or walnuts to the batter. 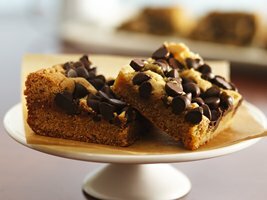 According to food historians, blonde brownies (also known as a blondie brownie) predated chocolate brownies, becoming popular in America in the mid-19th century. This is a perfect recipe to make for a large crowd as it makes 4 dozen brownies. 1. Preheat oven to 350 degrees F. Grease a 13 x 9-inch baking pan. 2. In a large bowl, with mixer on medium speed, cream butter. Gradually add sugars, beating until light and fluffy. Add eggs and vanilla, beat well. 3. In a small bowl, combine flour, baking powder and salt. Stir well. Add flour mixture to creamed butter mixture and mix well. Stir in chocolate chips and nuts (if using). Spread batter evenly into baking pan. 4. Bake for 30 to 35 minutes or until a toothpick inserted into the center comes out clean. Remove from oven and cool in pan on a wire rack. Cut into squares.